This Article applies a theory of rational choice to moral decisionmaking. In this theory, agents act primarily on local and personal knowledge to instantiate moral principles, virtues and moral goods. The State may seek to prevent them from acting as they independently determine by prescribing or proscribing certain conduct by formal legal means. If its purpose is to ensure that people act morally or become better persons, we call this “moral dirigisme.” Our thesis is that the need to use decentralized knowledge to determine the moral status of an act makes the task of the moral dirigiste well-neigh impossible. The Article models moral agents as ideal-typical utilitarians, Kantians, or natural law adherents. We show that within each of these systems the determination of the morality of an act depends on the “particular circumstances of time and place.” Our principal argument that the State cannot make people moral is derived from the plausible assumption that the State has inferior access to knowledge of the personal and local circumstances of the actor than the actor himself. Therefore, State does not possess a necessary instrument for the compulsion of morality. It does not have adequate concrete knowledge to know what is good. 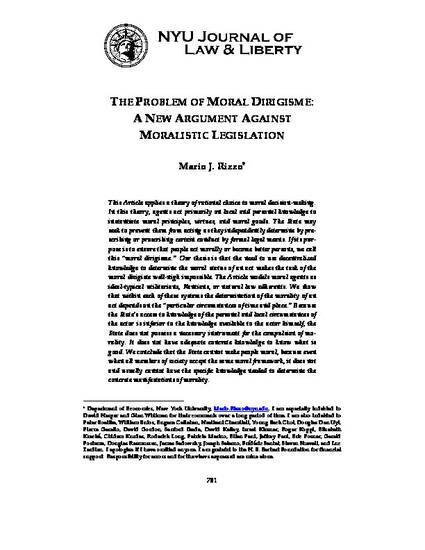 The Article discusses the meaning and intellectual context of moral dirigisme and then reviews some conventional objections. The Article then goes on, in Section IV to summarize the core of the theory and subsequently to present it in detail. We examine the different kinds or sources of knowledge in decisionmaking: personal or local knowledge, held either explicitly or tacitly. We then examine knowledge problems of different ideal typical agents. The analysis then proceeds to an examination of specific instances of morals and moralistic legislation. We also show that our thesis is not affected by the largely illusory character of “moral absolutes.” We conclude that the State cannot make people moral because, even when all members of society accept the same moral framework, it does not and usually cannot have the specific knowledge needed to determine the concrete manifestations of morality.